Hand made with care using only quality materials, with ” Shared hearts, Shared times, Shared lives” embossed in gold. 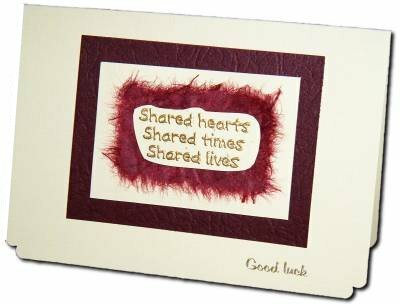 A6 size, with insert that says, “Best Wishes”, or this card can be personalised with your own message if required. Please contact me for details. All my cards come complete with envelope and are sealed in a cello bag. Please look at my other cards for sale as new ones are added regularly. Also custom made cards to order, contact me for details.